I had the privilege of being part of the Blessed team at the Greenbelt Festival this year as part of my placement with Fr Simon Rundell (I am half way through my training for the priesthood at Cranmer Hall). One of the worship events we put on was a service entirely conducted through Twitter. This was an experiment to explore how worship can work online. Below is an analysis of how it went and some thoughts for doing something similar in the future. An online service was conducted on Twitter on Sunday 25th August 2013 at 2pm during the Greenbelt Festival. Before conducting the service a discussion paper was produced outlining the idea, a script/liturgy was developed and adapted with input from a variety of people and the service was advertised via the Big Bible Project website and through various tweets. So this was a service conducted entirely through twitter – with no face to face ‘live’ element involved. The script was developed and tweets prepared by copying and pasting into Tweetdeck. One person tweeted the liturgy (Fr Simon) and four people retweeted and responded as and when appropriate to different tweets – either on the @tw_worship account or their own personal accounts. 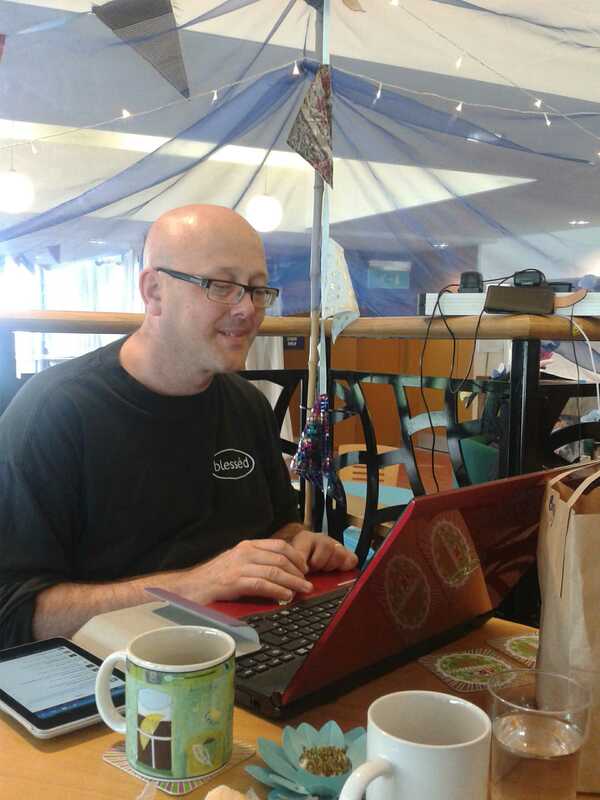 We decided to be all together using the contributors’ lounge at Greenbelt as we had a good power source and reliable wifi. It also helped to be able to discuss face to face the different needs of tweeters. We became aware of the risk of reaching our tweet limit (1000 tweets a day including retweets) about 10 minutes in so we started to reduce the number of times we retweeted others on the same twitter account. A total of 544 tweets using the #gb40smw hashtag were sent over the life of the experiment, on the day of the service 494 tweets were sent. The @tw_worship account has 150 followers (although this can’t be a measure of how many took part). 18 people responded to the survey we sent out via twitter using SurveyMonkey, two thirds women, a third men. The age range of the participants was from 18 to 69 with the majority being in the 50-59 age range. 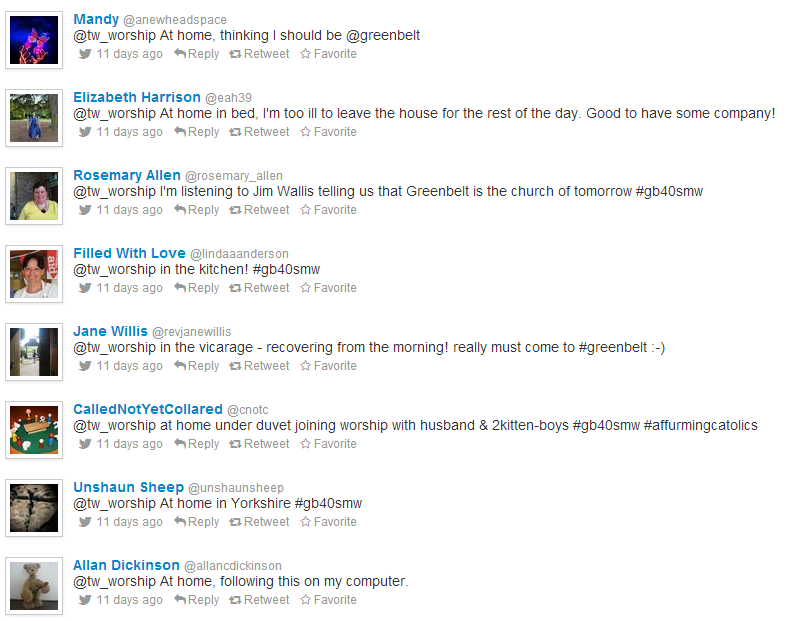 Two thirds of the respondents tweeted from home, a third were at the Greenbelt Festival as they tweeted. Most respondents felt that they sometimes engaged with God and other tweeters through this experience. The least successful/effective part of the service seems to have been the links to external content – like audio and video items. Some of this was because people tweeted along whilst attending other events and so couldn’t play videos. The service online was largely successful and provided people the opportunity to take part in an act of worship at the Greenbelt Festival whether physically present or not. One of the especially good reasons to conduct services online like this is because it enables people with illnesses or disabilities to partake fully.